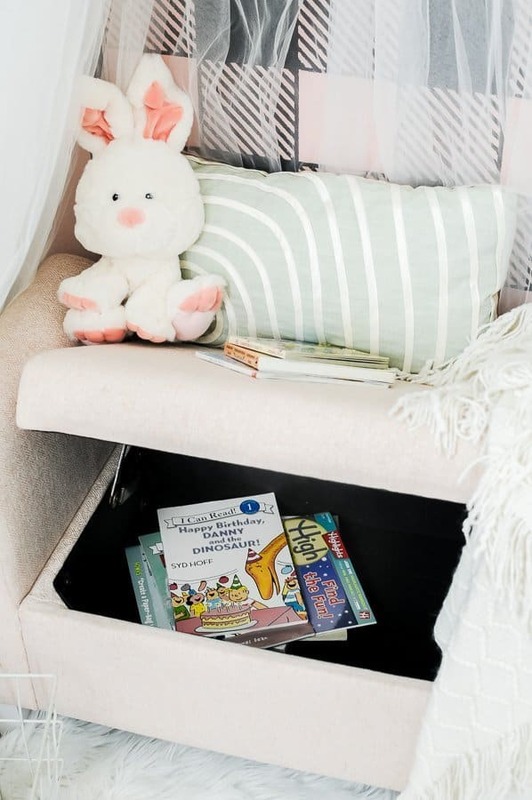 Joyful Derivatives » Blog » Decor Inspiration » How to Create a Kid’s Reading Nook out of a Closet! How to Create a Kid’s Reading Nook out of a Closet! Simple and affordable ways to transform an empty or unused closet into a fun place for your kids to read. 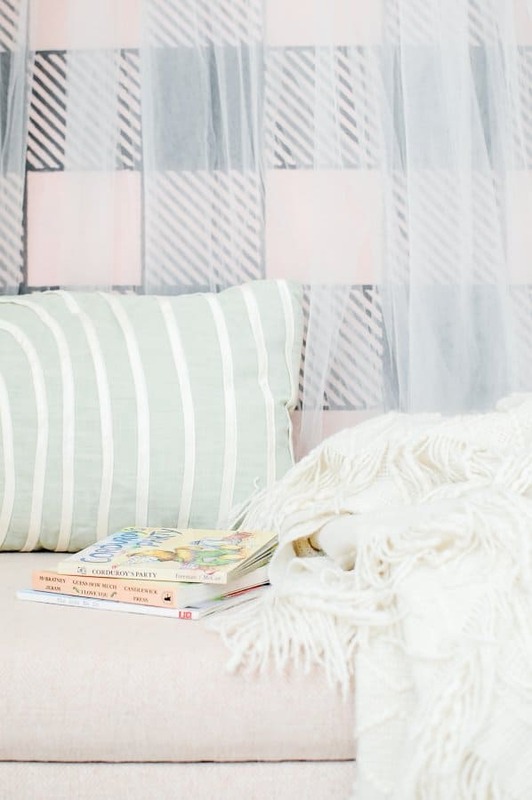 A kid’s reading nook gives them their very own special spot to snuggle in and relax. This post is spronsored by HomePop. As always, opinions are all my own. 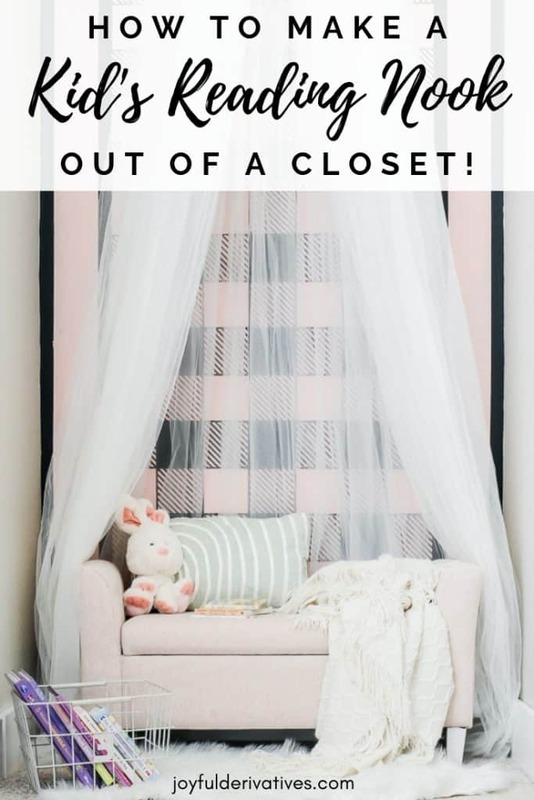 I am so excited to share with you how we transformed my daughter’s empty closet into a fun reading nook! Our daughter loves to look at books (she’s only 3 and doesn’t quite READ yet…) and even more than that, she loves to have a place she can call her own. Giving her a room to herself helped with that, but when we realized she didn’t really need the storage space from her new room’s closet, I knew we had to transform it into a kid’s reading nook for her! 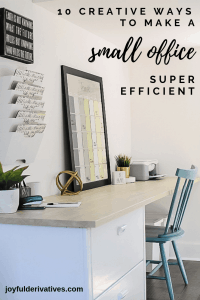 Let’s walk through how we did it, shall we? 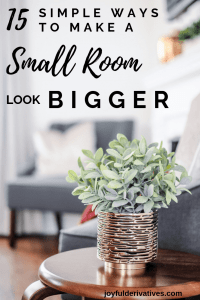 I hope this little mini-tutorial makes it easy for you to give the child in your life a fun reading spot in your home! The first thing you need to do is remove your closet doors and all of their tracks. Then, you should have a nice empty space to use for your kid’s reading nook. To give our reading nook a bit of extra flair, we chose to paint the back wall using a stencil and some dark colors. You don’t necessarily have to do this step, although I love how the tulle canopy looks with the buffalo check behind it! The third step is to hang a canopy inside the closet space. Center it in the closet and hang it so that the top of the canopy sits close to the ceiling. After your wall is painted and your canopy is installed, the next step is to start installing the furniture and decor! We chose this pink storage bench settee from HomePop and I think it’s simply perfect in there. 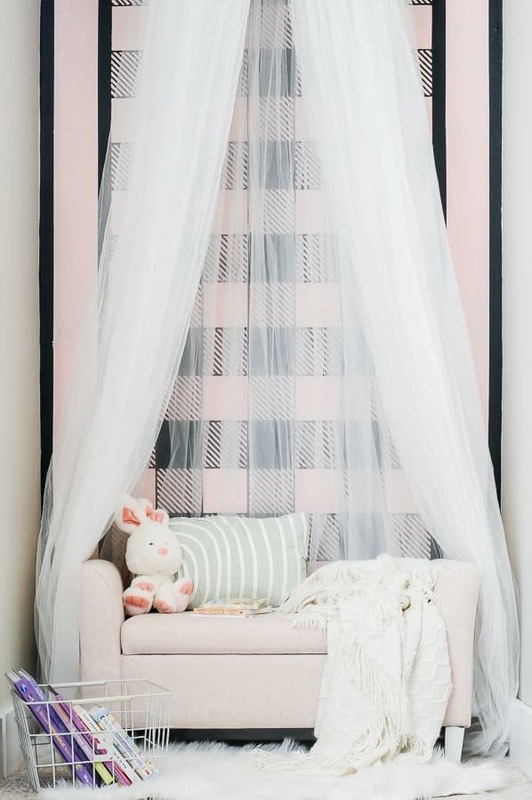 Not only because it’s youth-sized and stinkin’ adorable, but also because the arm rests of the settee are perfect for draping the tulle canopy around. Our daughter can easily prop a pillow against the arm rest and lay down on the bench too. Even better, it’s got STORAGE in it! 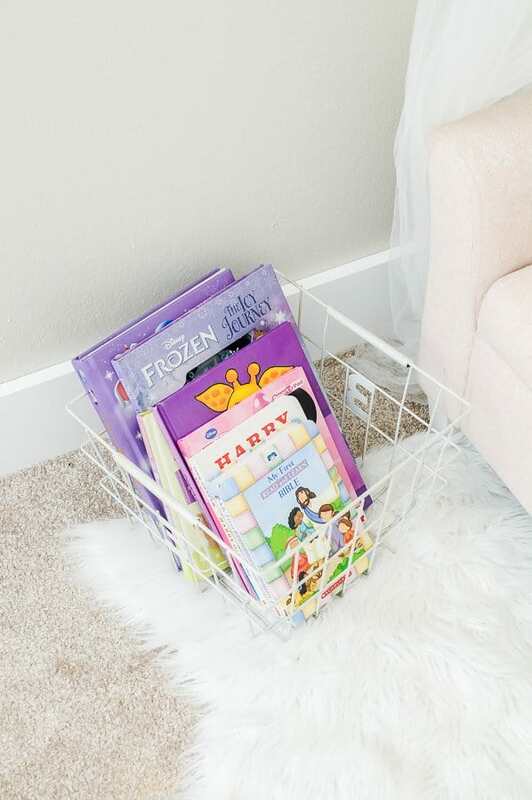 We all know you can’t have enough toy and book storage in a kid’s room, so that was a huge reason why we chose this piece for our kid’s reading nook. HomePop has lots of other fantastic youth-sized furniture to look through too, so be sure to head over and take a look! Your kids will love them! 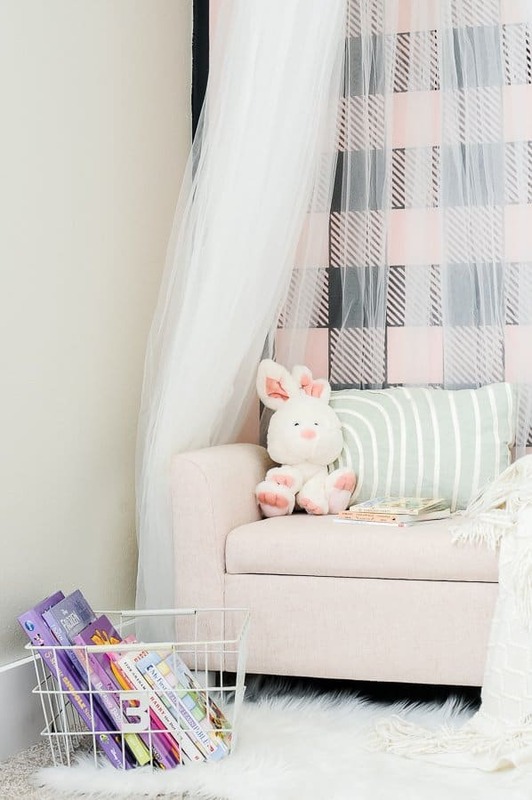 The last step to creating your kid’s reading nook is to add a soft rug, blanket, pillow, stuffed animal and basket of books! 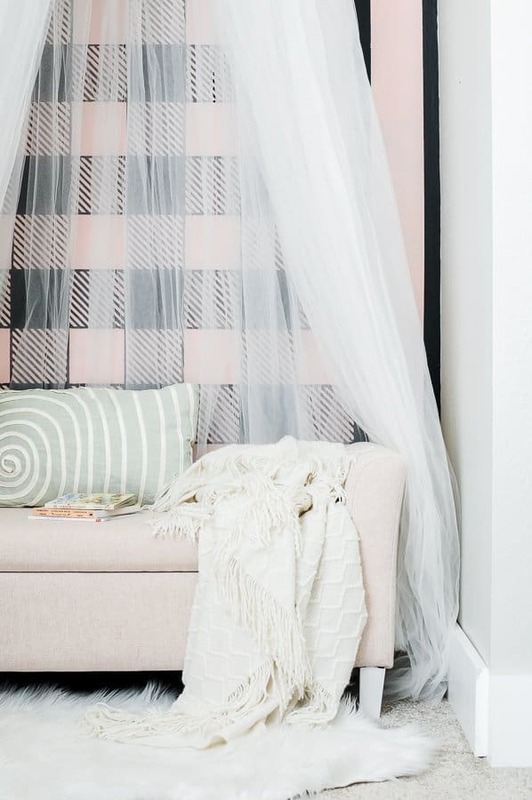 These little bits of decor add a lot of style to the nook and also make it cozy for your kiddo. I’m sure the books in this basket will get swapped out daily – but that’s part of the fun, I think! So, what do you think of our cozy, little reading nook? My daughter sure loves it! 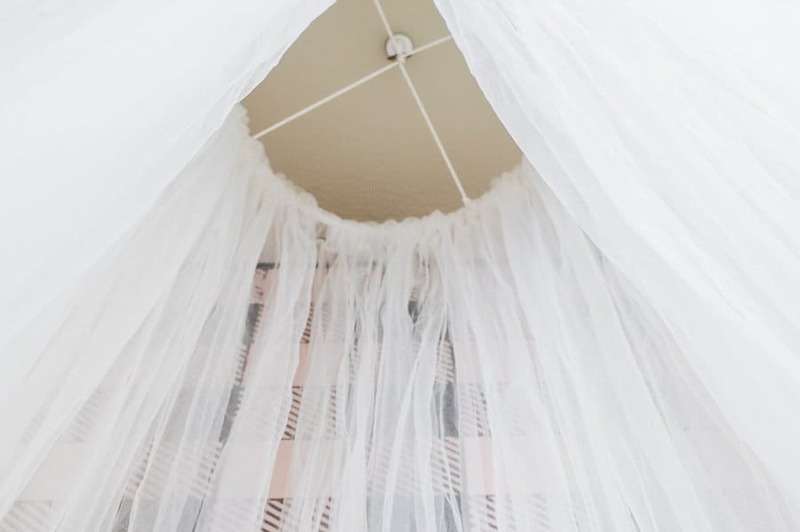 I’ll be sharing a tutorial for the DIY tulle reading nook canopy sometime in the near future – after a bit of trial and error I came up with a super simple assembly process and I can’t wait to teach you how to do it too! The best part was that I mostly used materials we had on hand, so it only cost me $5 to make. I hope you find this children’s reading nook assembly process simple and are easily able to recreate it in your home!